The security of its secret recipe is taken pretty seriously by KFC. This is so much that they’ve made Robocop the all-new Colonel and well, he’s taking his time seriously. The secret recipe of KFC was kept safe, and now the company has agreed on some updates. Enter Colonel Robocop, who’s in charge of guarding the whole secret. Although KFC upgraded the tech of the secret recipe too, encrypting it thrice and storing it in an underground data centre. This is some serious defence and we didn’t even mention that the data centre is in a nuclear bomb shelter, 100ft under a mountain. No one is going to get that secret recipe anymore. If you can go through all these defended, you’d have Robocop to deal with and we know he’s not going to be an easy opponent. 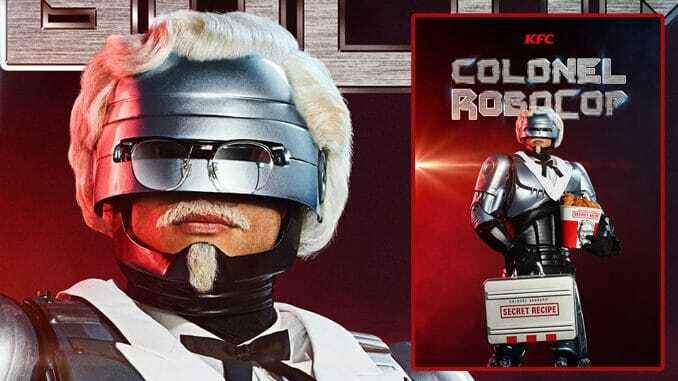 KFC decided to allow fans to know just what Colonel Robocop could do in a series of short TV spots, though as we see in the first one that doesn’t include any crime. No, Robocop’s main directive is to stop hunger. He finds someone and flies his chicken tender his way. That’s not gonna help the guy getting mugged, but oh you know. The next clip features Robocop having dinner with the guests when someone asks for the secret recipe. “I could tell you, but I’d have to kill you,” says Colonel Robocop. This is followed by some threatening fork movements, enough to make a stack of mashed potatoes run away in fear. Colonel Robocop then just laughs and the rest follow suit but the man knows he means business. You can have a look at out all of the clips in the videos above, and the description can be found below. “He once protected the streets of Detroit. Now he’s protecting KFC’s Secret Recipe. Meet Colonel RoboCop.